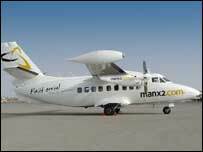 The Isle of Man airline, Manx2, has added a new route to its growing list of flight destinations. As well as flying to Belfast, Blackpool, Gloucester, Jersey and Leeds/Bradford, the airline now operates to East Midlands. The direct flights, which began on Monday, run every day except Saturdays. A spokeswoman for East Midlands Airport said: "We are anticipating a huge demand for the Isle of Man especially around the TT races in May."